To the south east of the hall is an area shown on the Ordnance Survey maps as ‘Hanging Banks’. It is not shown as such on the 1758 or Burdett’s Map of Derbyshire from 1759. 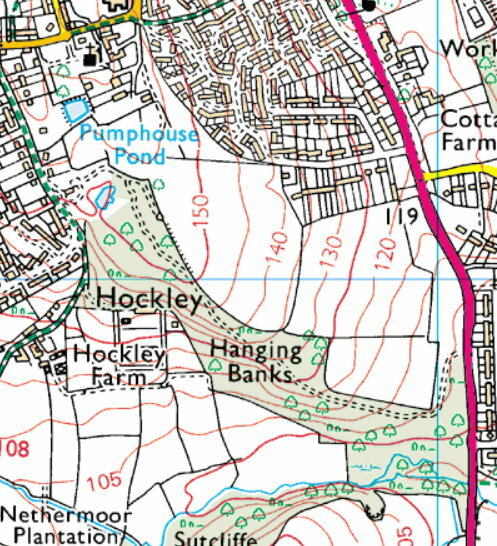 However it is marked ‘Hanging Banks’ on the 1898 OS Map. The name immediately suggests that it could have been a place of execution where gruesome acts were carried out. This may not be the case as it could be related to the fact that it is an area of steep sloping ground. There are other locations which carry the same name such as the Hanging Bridge at Mayfield on the A52 near Ashbourne. This also has an adjacent steep slope but also has Gallowstree Lane nearby which suggests something more serious. However legend has it that many of Bonnie Prince Charlie’s Scottish rebels were caught here, were tried and hung from gibbets erected on the old bridge. The final interpretation of Hanging Banks at Wingerworth must be subjective. One final comment relates to the description in the sale catalogue where the area is described as ‘Hanging Woodlands’..